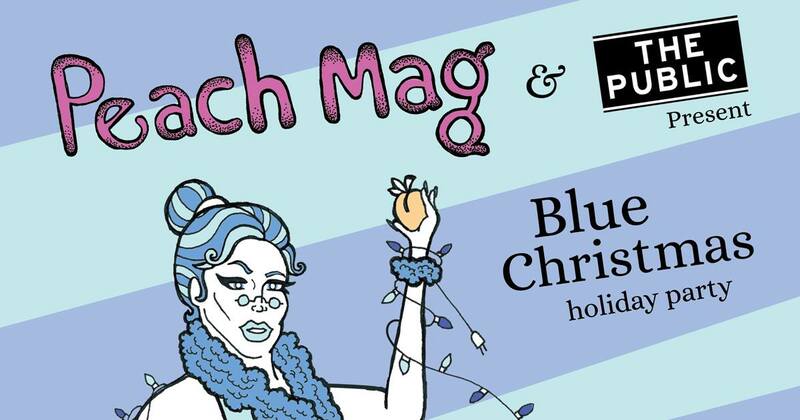 Peach Mag and The Public are celebrating the holiday season with a night of literary and musical performances. Local and visiting writers will open the Blue Christmas party with readings of published works. Headlining the readers is Jay Ritchie, a Montreal-bred poet whose debut collection, Cheer Up, Jay Ritchie, was recently released by Coach House Books. Joining Ritchie are visiting poets Caroline Rayner of Northampton, MA, and Liz Bowen of New York, NY. Rayner is a student at UMass-Amherst and author of the chapbook, calorie world (Sad Spell Press, 2017), and Bowen is a student at Columbia University and author of the poetry collection, Sugarblood (Metatron Press, 2017). The visitors will be joined by local writers Sarah Jane Barry and Matthew Bookin. The readings will be followed by a musical performance by singer-songwriter and founder of Buffalo Afrobeat Orchestra, Curtis Lovell, as well as a drag show by local favorite and founder of #SHElives, Vidalia May. The night will end with a set by DJ Gift Receipt. The night is sponsored by Community Beer Works and Ashker’s. FREE AGENT will also be open for business during the party. Peach Mag is a Buffalo-based, not-for-profit literature and arts magazine dedicated to publishing and publicizing the most exciting work in contemporary writing and art. The Public is Western New York’s true alternative media source, offering an honest and entertaining look at a fast-changing region and the whole spectrum of its culture. Tickets are on sale for the discounted price of $5 at peachmgzn.com/shop, or will be $10 at the door. Cash bar.